Duration: 50 Min. 26 Sec. The Ether is infinity that arouses undying curiosity which in turn sows the seeds for a great number of myths and legends surrounding it. The Ether has an innumerable amount of stars and planets that remain out of bounds of modern science race. Scientists and modern science have just about managed to excavate what is the tip of the provertial iceberg when one thinks of the enormity of the Ether. There are several thousand planets in the vast expanse of the Ether that revolve around the planets. We see the milky way and scores of stars with our naked eyes, yet so much lies beyond our interpretation and imagination. Thunder and lightning that emerge from the skies are a familiar thud in our lives. 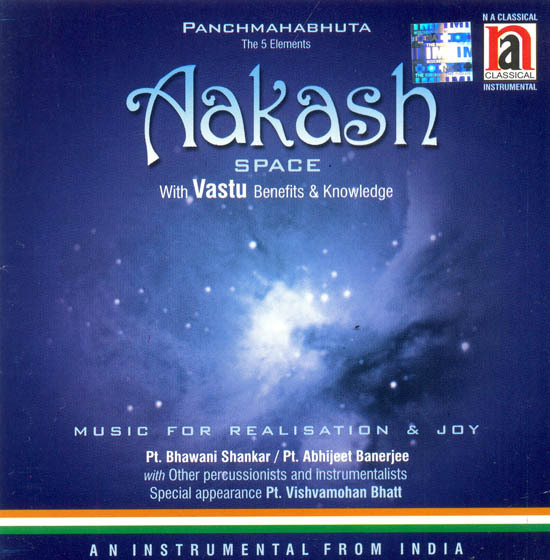 Sometimes distant and yet near while at other times close yet as given a new dimension in this superb music album dedicated to the skies in all its forms keeping the inherent beauty of classical music and using the percussion instrument ‘Pakhawaj’ as with the other instrument as the medium to celebrate the sky in its various hues. Vastu is the only body of thought that gives Space the status of a natural fundamental element. Architecture in Eutope did not even recognize the importance of space till modern times. Vastu Shastra is, therefore, superior to any modern or traditional school of architecture in the world. Aakash or the space is infinite and limitless. It is related to our sense of hearing, in a house, space element is related to the centre portion or the brahmasthan. It is important that brahmasthan be kept open and light. Any disturbances in the space element are detrimental to your growth. When you keep your office, home or factory in a mess, you spoil the space element around you. Extra construction, unutilized rooms or floors, homes stuffed with possessions, too big extravagant and opulent houses collect a lot of negative energy. It is recommended to build only the required area and no more. People intending to buy or build a house concentrate on fancy fittings and latest gadgets totally ignoring how much natural light or air the structure is permitting. Fancy fittings in a house can never compensate for a large open window. A house is your sanctum-sanctorum. It is a place where you should by able to unwind and rejuvenate yourself. A balance of the primary elements in the house brings you closer to nature and creates balance and harmony leading to peace. Space is also known as ‘Ether’ Ether is unique as it has only one character i.e. eternal. Either is the carrier of sound be it man made or otherwise. One can hear it. As ether is the only eternal element of the five elements it attracted the attention of various sages. The concept of Akashvani or Devine sound which is heard by sages of higher order is related to this Ether or Akasha. The primordial mantra AUM then in modern times Raam or Shyaam are to work as linkages between Jivatma (life force—atman or soul) to Paramatman or (Omnipotent of supreme soul). Other than five Elements there are are some other elements like Time (Kala) and Space (Sthan or Dik i.e. place and direction); Soul and Mind. Like ether Time and Space are eternal. Time or Kala is common cause of all actions of all the elements and is eternal link of predetermined actions and happenings. Thus in Hindu astrologly the whole world and its course are equated with “time”. The Direction or Dik are part of Space and North, South, West and East are eternal no matter the Universe undergoes whatever changes. Then the other element is Soul which is related with the knowledge system of man as jivatman and the eternal Knowledge of God or Paramatman (omnipotent). The last of the nine main elements is the manas or Mind. It’s the sense-organ or path to experience the world eternally and otherwise. These sense organs are in the shape of eternal paramanu or atom and works is combinations to derive pleasure at worldly levels. These are the brief out line of all elements. It is said that our universe was created out of the manifestation of five elements. This was described in the Devigita very elaborately. Devigita proclaims that Shakti went about creating the world with 24 tattvas or elements. The five elements were born out of the primordial principle of unmanifested Shakti. The ether through which sound traverse was first element, which is also known as Sabda-rupa (form of sound). Second was Air or (Sparsharupa or a form which is felt) The Air or Vayu give rise to Agni so it called Vayoranih. Then sense of taste or ‘rasrupa’ the water element came. The gandharupa or the source of smell came – the Earth. The whole universe is made up of five basic elements, the earth, water, fire, air and space. Our body is also made up of these five basic elements. The pancha-mahabhootas are related to our five senses of smell, taste, hearing, touch and sight. This knowledge co-ordinates five elements of our body with the five elements of nature along with natural forces. So that, we take advantage and benefit from nature and environment in our daily activities and live or work with convenience and safety. Therefore this knowledge is very useful and profitable for us and help in our daily activities. Each work has its nature and features, aforesaid knowledge gives us which is the appropriate direction for a desire work, where and how to construct a room, outer structure and interior arrangement of rooms according to the nature of work so that we do our work without any problem and handedness. Any imbalance in our external and internal Vastu translates into unhappy situations. Vastu teaches the individual to live in balance and harmony with the panchamahabhootas. This knowledge tells us about the nature and work of directions and what kind of work do in which direction. Vastu knowledge advice what kind of work is best in which directions at where it is medium normal and averge and which direction is prohibited for concerned work. Vaastushastra tells us about the problems which comes in human life like physical problem, mental agony, downfall in business and other routine problem of the nature and environment and also suggests such kind of problem by remedial Vastu knowledge so it evidentially proved Vastu knowledge is very useful and profitable for human life and by this knowledge we get maximum benefits from nature and environment as well as we live or works with safety and convenience.